Apprentice level knowledge of magic. Tiffy is a young woman with large, shockingly blue eyes, bright red hair, tan skin and a slender figure. She prefers to dress in goth style with heavy eye makeup and black lips and nails. 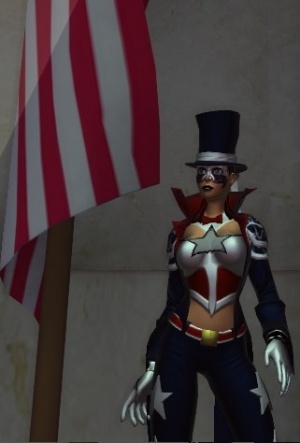 Her hero costume is an outlandish patriotic themed outfit with a red, white and blue mask, top hat, garish jacket and flared pants. Tiffy was always interested in the occult. From bad movies, to books on the supernatural to special 'rituals' she enacted with her friends, the girl found it all fascinating. Amusingly however, when she discovered she had talent for magic she was actually a bit more afraid than she thought she would be! What exactly could she do with this? How could she learn more about it? What would her parents, who already disapproved of all this kind of thing, think about it? She mostly kept the whole thing under wraps, dabbling here and there and trying to learn what she could on her own. Understandably, she wasn't really getting anywhere with her limited means and was becoming more and more tempted to seek out someone to teach her. As luck would have it, she didn't have to look far! The young mystic heroine Scripture happened to move into the apartment building she was living in with her family and after 'overhearing' a conversation involving the supernatural managed to secure a meeting and an apprenticeship with her! Tiffy has a lot to learn but is very excited about beginning her training... and her hero career! She even has a ridiculous costume all lined up. One that no one would ever suspect her of wearing. Charitably, Tiffy can be described as something of an airhead. Despite her goth clothing and makeup she's bubbly and goofy and it's hard for her to pull off the air of mystique she so desperately wants to. She also has a tendency to come off as a bit spoiled (which she is) and lazy (also true). On the positive side, she's a quick learner and can be quite generous when she's motivated. -Magic Talent: Tiffy has some natural magical talent that allows her to pull off a few simple spells without much preparation or effort. She's good at creating phantom lights and sounds, showing aptitude for illusions as well. -Eye for Magic: A power Tiffy doesn't fully realize yet. Her natural talent allows her to understand mystical text easily and avoid becoming ensnared or corrupted by enchanted words. This power only works on magically active writings and doesn't allow her to understand foreign or dead languages normally. It also gives her a degree of protection against supernaturally induced fear. -Glob: Glob is Tiffy's familiar. It is a shadow creature known as a blot and though not especially powerful it's perfect for a young mage in training. He's not especially useful at this point. -Basic Magery: Probably not a real word but that's okay. Tiffy has a basic and growing understanding of magic and has shown some skill with rituals and can identify magic in use and discern its purpose. She also knows a bit about extradimensionals and what they're capable of. -Just a Kid: Tiffy can be somewhat childish at times and is still dependent on her parents. This greatly limits what she can and can't do as a hero and as a budding mage. -Lacks Experience: Tiffy is very much at the apprentice level. Though she has some natural talent she's definitely not ready to be out on her own. -Brunhilde Faust: Brunhilde 'Hilde' Faust is a surprisingly competent thirteen year old wizard who Tiffy met recently while playing a magic board game rumored to grant wealth. She has an extradimensional workshop inside a playhouse in her family's backyard and is being mentored by her great grandfather's spirit (Seymour Faust), which is currently residing in a finely crafted fake skull gifted to him by Scripture. Her parents know of her supernatural dealings and do their best to stay out of it. -Nana Hartly: Tiffy's odd, witchy grandmother. She got Tiffy interested in the occult. Her father finds her to be very embarrassing. -Scripture: The Master! Tiffy is quite fortunate she ran into Scripture instead of some weirdo. -Wicket: Not to be confused with wicker. Tiffy thinks he's kind of a spaz, but he's alright. -Leonard Castellar: Creepy old dude with a bone hand. He seems to know what he's doing at least, right? Who would want to mess with Tiffy? -Is not a very good goth, but her friends put up with her because she's cute, knows what she's talking about and buys them things. -Is actually smarter than she seems. She has an excellent memory, passes her classes with ease and is quite observant, making note of small details and storing them away in case they're needed later. -Has a bad habit of eavesdropping. -Is excitable and a blabbermouth. -Her hero name comes from/was inspired by the Rob Zombie song, "American Witch". This page was last modified on 2 March 2014, at 18:26.